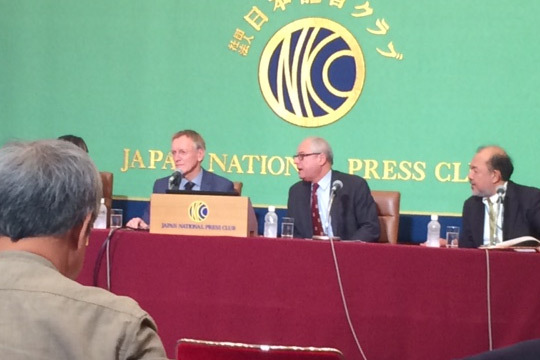 Nabil Nasr, associate provost and director of RIT’s Golisano Institute for Sustainability, delivers new research on circular economies from the International Resource Panel during a news conference at the Japanese National Press Club in Tokyo. Rethinking how industrial products are manufactured and dealing with them at the end of their useful life could provide breakthrough environmental, social and economic benefits, according to new research from the International Resource Panel (IRP). The report is co-authored by Nabil Nasr, associate provost and director of RIT’s Golisano Institute for Sustainability (GIS), and Jennifer Russell, a former Ph.D. student in sustainability of Nasr’s at GIS. The United Nations Environment Programme panel is widely considered the most authoritative scientific forum for scientists and experts working in the area of natural resource management worldwide. Nasr is one of only three U.S. members. Value-retention practices such as remanufacturing, refurbishment, repair and direct reuse could cut industrial waste by between 80 and 99 percent in some sectors. Greenhouse gas emissions could fall by 79 to 99 percent across these sectors if value-retention practices were adopted. The report titled “Re-defining Value–The Manufacturing Revolution. 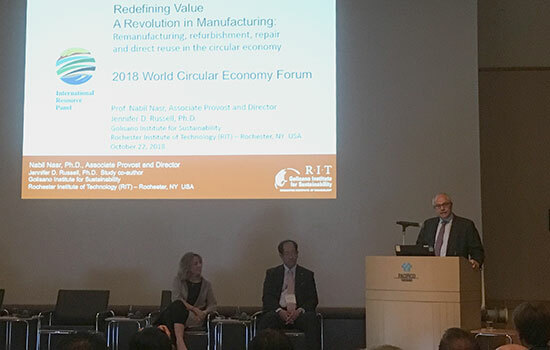 Remanufacturing, Refurbishment, Repair and Direct Reuse in the Circular Economy” was released Oct. 23 at the World Circular Economy Forum in Yokohama, Japan. The report examines industry sectors such as automotive parts, heavy-duty offload machinery and industrial printing equipment. But there is significant potential beyond these sectors for further reductions, the report contends. Today, two-thirds of the world’s population lives in cities, draining nature of materials to build homes, schools, hospitals, roads, transport systems and factories. Urbanization—together with a growing middle-class—has increased demand for consumer goods. In the 20th century, the world excavated, chopped down, drilled for or harvested 34 times more construction materials, 27 times more ore and minerals, 12 times more fossil fuels and 3.6 times more biomass than in previous years. According to the report, adopting value-retention processes is a win-win situation for governments, industry and customers. Governments would have less waste to dispose, generate green jobs and stimulate economic growth; industry could lower production cost, avoid resource constraints on business growth, and open new market segments; and customers could benefit from lower prices for refurbished products. Currently, remanufacturing accounts for only 2 percent of production in the United States, and 1.9 percent in Europe, leaving ample opportunity to develop these markets. While there is no one-size-fits-all approach, the report states, where pursued strategically and systematically, adoption of value-retention processes can accelerate a country’s move to a circular economy, increasing production without increasing the negative environmental impacts. The circular economy refers to an industrial economy that is restorative by intention and eliminates waste through thoughtful design.